The first confirmed reference to Hastings is to a mint in 928, showing it was already a place of importance, though on a different site. Old Hastings today consists of two streets, High Street and All Saints Street, either side of a stream, the Bourne, now covered by a road. To east and west are hills with sandstone cliffs. In the C11 the town was beyond the western hill, where the centre of the modern town is. The port was on the open coast further west at Bulverhythe (= Burgesses Hythe or Harbour), which retains the slight ruins of a church, possibly C13. Town and port probably moved because of the encroachment of the sea, except the Priory of the Holy Trinity. In 1017 Hastings was granted to Fécamp abbey but Godwin seized it under Edward the Confessor. When the Conqueror landed in 1066, he built a temporary fort on the west hill where a church of St Mary may already have stood and settlement round the Bourne probably started then. In 1069, having compensated Fécamp elsewhere, William granted the strategically vital castle, rebuilt in stone, to William d’Eu as the seat of one of the rapes of Sussex. St Mary’s within the walls became collegiate. The town along the Bourne prospered, with a wall across the mouth. Its omission from Domesday Book is an error, for it was widely seen as chief of the Cinque Ports and had a big fishing fleet. However, by the late C12 Rye and Winchelsea were more important as harbours and except the church, the castle was little used after 1216. The French twice sacked the town, in 1334 and 1377, so no early church other than St Mary remains. Damage in 1377 was severe and the two old churches now in use, All Saints and St Clement, were rebuilt slowly. The sea was no kinder – its onslaughts led in 1413 to the removal of Holy Trinity Priory inland to Warbleton. Other parishes, St Michael, St Peter and St Margaret, were depopulated. Although ruins of St Michael and St Peter were still visible in the early C19, they seem not to have been used after the C15 and Holy Trinity is not recorded after a burial in 1533. The parish of St Andrew from the C16 used St Mary-in-the-Castle until that too fell into ruin. From the C16 to the mid-C18 Hastings was at its lowest point and as late as 1807 (GM 1807 part 1 page 105) the livings of All Saints and St Clement were ‘consolidated’ (i e held in common), but increasing prosperity, still based on fishing, had already led to a doubling of the population between 1737 and 1801 within the confines of the old town. There was a scheme for a bathing resort at the sea end of the High Street in 1768, but only in 1805 was the land to the west developed. This was promoted by the earls of Chichester, a branch of the Pelhams, who owned the castle and the land by the shore below. In 1824 Pelham Crescent was laid out with a proprietary chapel in the centre, for which the dedication of St Mary-in-the Castle was revived, though the houses were not finished for 12 years or more. Starting in 1828, the land further to the west was developed as the resort of St Leonards. It was named after Hollington church, which though some miles north, was the parish church. In fact, the original St Leonard’s may have been a chapel in the southern part of the parish. To complicate matters further, a new proprietary chapel of St Leonard was built in 1831 for the new resort. Only in the mid-C19 were Hastings and St Leonards joined, with the development of the area around Cambridge Road and Robertson Street. Teulon’s Holy Trinity (1851) here, perpetuates the dedication of the priory. A new church of St Andrew was built in 1869 (since demolished) and in St Leonards the old parish of St Margaret was reconstituted in 1870 with a church dedicated to St Mary Magdalene. At first, most new building was near the sea, but from 1860, there was housing on the hills behind. Provision of churches was generous – too much so for today – and some are very fine, eg James Brooks’s St Peter (1885) and Pearson’s St Matthew (1884). In the area around Warrior Square station the largest church in the town, Blomfield’s Christ Church, London Road, was built in 1875. Before a separate parish of Ore was established, its existing church of St Helen was rebuilt in 1869 on a more convenient site and new churches included Gough’s Christ Church (1858). Most churches were by London architects, several of whom had offices in Hastings, e g Henry Carpenter, though none was very noteworthy. 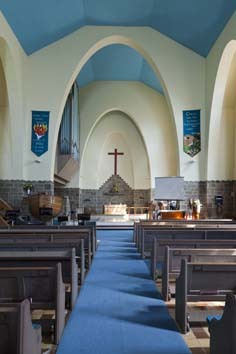 Around 1900 several local architects, like M J Lansdell, altered existing churches or added fittings. As the town grew, a second church was built in the parish of Hollington in 1865, though the old church remained a tourist attraction. Only since 1960 has it lost the last of its rural character. The continued expansion of the town after 1920 led to new churches (e g St Ethelburga), but mostly existing ones sufficed. Most built since 1945 have been architecturally undistinguished, but two rebuilt after war damage deserve notice – Sir Giles and Adrian Scott’s St Leonard (1955-61) in the simplified gothic that was their hallmark, and H S Goodhart-Rendel’s rebuilding in 1951 of Blomfield’s St John, Upper Maze Hill. This incorporates some old work and is otherwise in a free rendering of C19 brick Gothic.